Hey, how are things going? Hi! I'm sorry for not checking in. Our grandmother has now reached the final stages of Alzheimers. My sister has continued the treatment and it scares me every week. She still has to go extremely slow but doesn't get the scarey throat closing up reactions. She does get many side effects after which seems to take 3-4 days to go away. She has had three infusions now and the scheduled a break for this week. She told me today that she thinks she is going to tell him she wants to stop. That was music to my ears. I tried and tried to get her to that decision from all that I've learned from you all here but she had to do that herself. Her counts concern me now with the added stress of our grandmother but hopefully they will stay up. She also said if it doesn't work she may get a second opinion at John Hopkins. We are about 2 hours from there. Does anyone know a good Dr at Hopkins? I was even more thrilled with that. Thank you so much for all yiur knowledge and concern. It has helped me so much. Sorry to hear about your grandmother. I know how hard that is. How are your sister's counts? When it all started it was 39,000. Week 2 it was 299,000. Week 3 was 239,000. It dropped. I am guessing it is the steroid she is getting in the IV before she get the rituxan is doing that??? I just don't see how taking three days for each infusion is a good thing. Counts will fluctuate, so it could just be a normal fluctuation or it could be related to the steroids, hard to know for sure. At any rate, her counts are good and it's entirely possible that further Rituxan treatments will do nothing more than it already has. I pray they stay good for a long time. This has really been difficult for her. I just keep saying that you probably already all you need for it to work. I have never read anything about 8 treatments let alone it takes her 3 days to get the treatment because she has to go so slow. I have asked and asked about another opinion until I'm blue in the face. She only says I'll go if this doesn't work. She has about every side effect listed and just keeps being told its a side effect. Sorry to vent. I'm just at a loss and am so concerned about her putting more of this medicine in her. Thank you so much for your kind words. I pray each time she puts this medicine in her again. The frustrating part for me is we are two hours from two major hospitals. I can imagine how frustrated you are. That doctor is something else. She hasn't had a count since the 25th of February. It was 234,000 that day. She hasn't had any symptoms that I am aware of that would signal a dangerous level. She was supposed to go this Wednesday-Friday but asked him to postpone again because of my grandmother and not being too sick for the funeral. I just wish she would wait and see but she is an adult and can make her own decisions. It's just hard to watch. Thank you again for letting me vent. 8 treatments would be crazy...and I usually don't second guess doctors!!!! 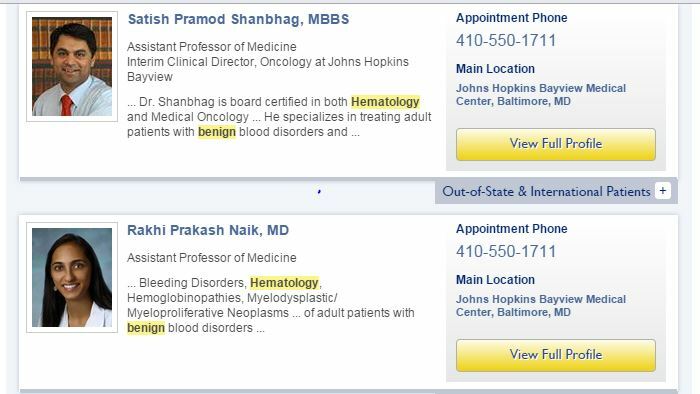 EDIT: Rakhi Prakash Naik, MD specifically lists ITP as an interest, so I'd try to get in to see her. Without a count, how could he possibly know if she's already responded or not? Grrrr. I have no idea! Now, she just called me and said she has little blisters on her back and arms. She is trying to get an appointment with him today. I just want to get off this train. Good news (I think) she has an appt this morning. If he says its just a side effect I think I'm going to have a stroke! At what point do you say the side effects are worse than the disease? I know she can't have really low counts but there has to be something better out there for her at this point. Let us know how it goes. Her doctor sounds like a real piece of work. Well, she could have low counts. That is possible, but maybe not. But it's also possible that she just hasn't responded to Rituxan yet. I can't believe he hasn't checked her count for so long. You can't possibly know how things are going during active treatment if you don't get a count. I had one done every week right before my infusion. Geez, she's already there. To answer your question about side effects....most of us here agree that side effects are worse than the disorder, but there is no way to avoid them unless you don't treat. If a side effect becomes too bad from a particular treatment, you stop using that treatment. Sometimes the patient has to advocate for themselves and I advise people strongly to do that. Now, she just called me and said she has little blisters on her back and arms. What kind of blisters? Blood blisters are a reaction to low platelets. Regular blisters result from a severe reaction to Rituxan. Okay so the count is 277,000. It went up from the 25th. The blisters are yet again another side effect. She is stopping the small steroid dose and doubling her fluid pill because of fluid retention. They are meeting next Wednesday when someone can go with her and he did say about stopping the treatment. Sandi...do you think what I have described warrants saying NO MORE?? I have from the second infusion. It seems nuts to me to sit 3 days for 8 hours each day trying to get this medicine in her let alone all the other problems fever, rash, itching, joint pain, flushing, flu symptoms, feet peeling and now skin blisters. Please, please, please convince your sister to go for a second opinion. I am trying so hard. My parents are now on board with me so I'm hoping that will help. I looked up the skin reactions pictures on the internet fron rituxan. It doesn't look like any of those. It looks like little pimples with fluid. Thank you all so much for your support. Yes, I agree that Rituxan should end now. No need for any more. Did this doctor say what he thought the blisters were? He needs to deal with that or refer her to someone who can. Something like that can be serious. The symptoms that Rob cited appear to be Steven Johnson Syndrome and while I doubt that she has that, someone needs to find out what is going on. I really think she needs to see someone now. All she told me was that it was a side effect. Her gave her a cream to put on them. Her back and arms are not covered in them like the pictures I saw. It is more of little blisters here and there. She did not tell me what that cream was. He seemed more concerned from what she described to me by the fluid retention. She doesn't always fully disclose everything probably because she thinks I am nagging. I didn't even realize that she was getting steroids other than what they were using before each treatment. There is still a chance the Rituxan could still work with only three doses, right? I think I read that from someone. Yes, Rituxan could still work and possibly already did. Her counts are fine. If she sees more blisters, gets fevers, has more peeling skin or any other 'side effect', please have her go to the ER. Better to be safe than sorry. If she was only on a 'small amount' (a few mg's), it shouldn't affect her counts much. If her dose was 10 mg's or more, her counts could drop some. Also, if her dose was 10 mg's or more and she stopped suddenly, she could get some withdrawal side effects such as fatigue, muscle pain, joint pain, etc. She might even be having some of that now, most of us did as we tapered. It gets harder at the end. It's easy to feel fed up and her counts are great so she can relax about that for now. Agree, it seems that the side effects she has now are the bigger problem. Do people who respond to steroids often respond to rituxan? I guess I could say she responded to them... the counts went up last year when she took them but fell about 3 months after she stopped. I just pray after all these troubles that she at least gets a response. Ha, the literature I saw the other day actually says 'no', but steroids and Rituxan were the only things I did respond to. So, my answer is yes based on that and all of the other people I've witnessed over the years. Where did I see that? Hmmmm. It was in a conversation with Emily.